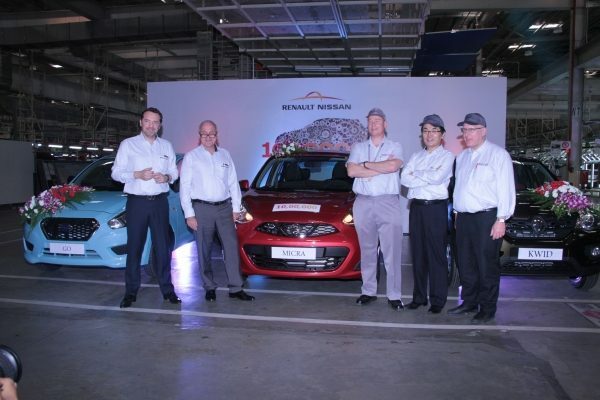 Chennai, India: The workforce at Renault-Nissan's Alliance plant in Oragadam near Chennai, India has reached a significant production milestone by manufacturing its one millionth vehicle. The landmark car – a Nissan Micra, rolled off the line at 1215 hrs. on Friday, 8th January 2016. The plant, which is the largest Alliance production facility in the world, started operation in March 2010 following an INR 45 billion initial investment and INR 16 billion additional amount to create the world-class powertrain manufacturing facility and tooling. The plant has introduced 32 new Renault, Nissan and Datsun models and derivatives to its production line. The plant caters to both domestic and international markets and has developed into India's second largest car exporter with more than 600,000 units shipped to 106 countries since 2010. In that time annual production volume has risen from an initial 75,000 units in the 2010 financial year, to over 200,000 by the end of CY 2015. 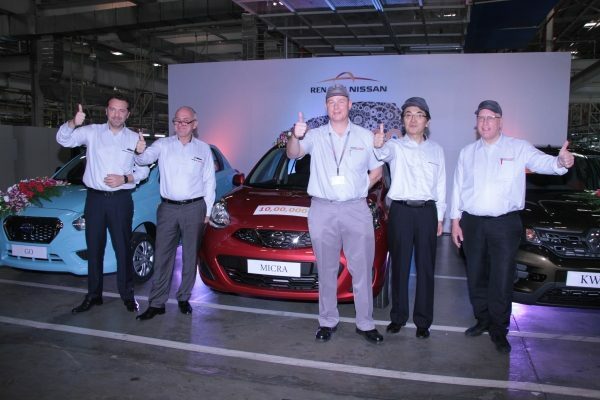 Christian Mardrus, Chairman of Nissan's Africa, Middle East and India region, and former Alliance Executive Vice President, commented: "I congratulate our workforce in Chennai for achieving a significant landmark in the ongoing evolution of this important plant." "Our Chennai facility has, and will continue, to play a fundamental role in the development of our business in India. Today's milestone reflects the popularity of Nissan and Renault products in India and export markets, as well as the skill and dedication of our staff. It is also a measure of the high level of support we have enjoyed from the Tamil Nadu government." The plant was established by the Alliance to meet the growing demand from Indian customers for high quality, locally-produced cars. It is complimented by a major R&D centre, also in Chennai, which plays a huge role in model development in India ensuring products are locally relevant. Together, the manufacturing plant and R&D facility account for around 12,000 direct jobs in Tamil Nadu, with a further 40,000 in the Indian supplier chain, making an increasing contribution to the local economy. "The workforce and our supplier partners deserve enormous credit for achieving this while increasing annual production volume and maintaining world class quality levels." The most recent model to be introduced at the plant was the popular Renault Kwid in September last year. This will be followed in 2016 by the third Datsun-branded vehicle to be sold in India. Renault-Nissan plant in Oragadam, Chennai is the first dedicated Alliance global plant. Representing an investment of 45 billion Rupees over 7 years, the plant has the capacity to produce 480,000 units per year at full ramp up. The Renault-Nissan Alliance announced its plans to build a new manufacturing plant in Chennai, India, by the signature of a Memorandum of Understanding with the Government of Tamil Nadu on February 22nd, 2008. The official groundbreaking ceremony took place on June 6th, 2008 and the production started in May 2010. The first vehicle produced at the plant was the Nissan Micra, a global hatchback.